A. Vinod Kumar is Associate Fellow at the Institute for Defence Studies and Analyses (IDSA), and a Visiting Faculty at the Institute of Foreign Policy Studies (IFPS), University of Calcutta, Kolkata. His research interests include nuclear policy issues (including non-proliferation, nuclear energy and deterrence), missile defence and India’s relations with the great powers. Kumar’s first book titled India and the Nuclear Non-Proliferation Regime – The Perennial Outlier was published by the Cambridge University Press in April 2014. He has written extensively in acclaimed publications including Bulletin of the Atomic Scientists, The National Interest, Strategic Analysis, South Asian Survey, Asia Times, Huffington Post, The Indian Economist and Vayu Aerospace Review, among others. 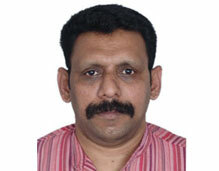 Prior to joining IDSA, Kumar was a journalist with stints in print and audio-visual media platforms and have spearheaded pioneering endeavours in mass communications including the first political public relations campaign in Kerala. He has been a private broadcaster as well as a first generation online journalist and was part of many web ventures, including as Executive Editor of South Asia Monitor – a media diplomacy platform. Kumar was earlier a Fellow at the Indian Pugwash Society. His ongoing study is on the implications of missile defence for nuclear deterrence. Concurrently, he is also spearheading an archival mining effort to trace India’s nuclear and foreign policy history. Kumar is recipient of the Ministry of Defence Madras Medal.